Riding a motorcycle is a dream for many individuals. It can be a fun and fulfilling experience, but it also requires proper care and attention. Driving a motorcycle is 28 times less safe than driving a car, and it requires a different set of skills. Becoming a safe motorcycle driver requires practice, but following these tips will put you well on your way to mastering the basics. According to the Institute for Highway Safety, helmets have a 37% effectiveness rate in preventing motorcycle deaths, and about 67% effectiveness rate in preventing brain injury. The absolute easiest way to increase your personal safety is to wear a high quality, properly fitting helmet every time you ride. If you ever carry passengers, make sure that they are equipped with proper helmets, too. If you are in an accident, the friction of the road can cause serious damage to your body if you don’t take proper precautions. It’s as essential as wearing a helmet to cover your arms, hands, legs, full feet, and ankles. Even on a hot day, you should aim to wear leather or something that provides a layer between you and the road. It could make all the difference if you fall off of your bike. Your lights and turn signals work. A shocking 2019 study in the journal Transportation Research showed that most drivers instinctively view cyclists as “less than fully human” when they are riding a bike, which leads to unintentionally aggressive and dangerous behavior towards them. While you might feel much more empowered on a motorcycle than on a bike, a similar phenomenon happens when drivers see you on the road. Because your bike takes up less space than other vehicles do, they’re more likely to crowd you into half of a lane or make other dangerous maneuvers that could jeopardize your safety. When you are on a bike, you must drive defensively: Use your horn if a driver is too close to you and be extra alert of the conditions of the road and any traffic signals. Of course, always keep your headlight on, use your turn signal, and avoid vehicle blind spots. You know not to do this, but it bears repeating. There is no safe amount of alcohol or drugs for driving a motorcycle, so if you have imbibed, take a cab or ask a friend for a ride. Unless you are 100% sober, you should not risk your life and the safety of others by hopping on your motorcycle. A recent study from the American Automobile Association (AAA) found that nearly 10% of crashes involving damage to property or other people involve a driver who drove when they were drowsy. Make sure you are alert – not just sober – before you hop on your bike. 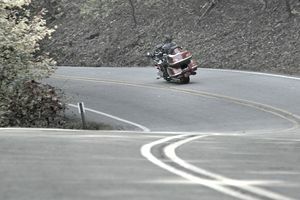 In addition to helping you save money on insurance premiums, taking a reputable motorcycle safety course will teach you basic and advanced techniques to help you be a safer and more confident driver. You just might meet some fellow motorcycle enthusiasts to strike up a friendship with, too. Never take risks that are unnecessary. If you are not an experienced rider, don’t ride at night, during the rain, or on difficult terrain. Only drive in places and during times that you feel totally comfortable driving. Your pride is way less important than the safety of yourself and those around you.